As a subscriber to Saveur Magazine newsletter I receive several recipes each week. Last week I was intrigued by Potato Pizza so last night I have decided to give it a try. What an incredible meal it was! Only drawback, if you can call it that, is that Melted Onions that replace traditional sauce took well over 4 and half hours to make. Yup, four and half hours! 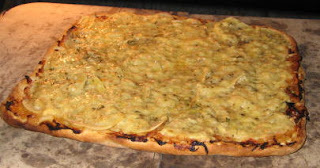 Melted onions go first on pre-baked thin crust pizza. Potato slices is the main topping. Then oregano, Fontina and Grana Padano cheese.